Hello everyone! Today I'm celebrating Canada Day by going out and watching fireworks at City Hall! 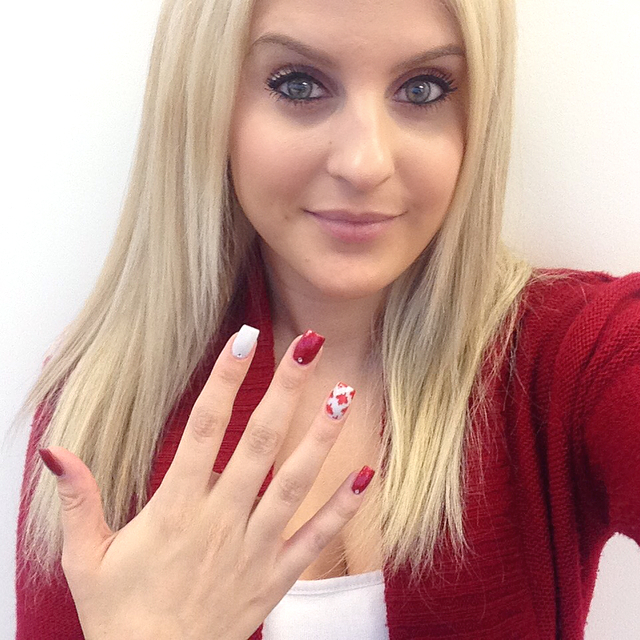 @mrsveenails & @nailexperiments on instagram organized a Canadian themed nail collaboration, so I thought I'd join in since I always do my nails for Canada Day. I painted my pinky, middle finger, & thumb with three thin coats of Beyond the Nail - Red Microglitter. On my ring finger and index finger, I used two coats of Beyond the Nail - Winter Wonderland. When everything was dry, I placed a couple of Maple Leaf nail decals over my ring finger, and cut off any parts of the decals that were hanging off of my nails. I topped each nail off with PRO-FX - Quick Dry Topcoat, and placed a rhinestone (that I bought off ebay) at the top of each nail.